While many of those who haven’t utilized our services might assume they’re only meant for indoor remodeling projects and renovations, the staff at Intermountain Stone & Marble is here to tell you that this isn’t the case. Not only do we provide numerous outdoor fireplaces and related fire features in customized natural stone, we can also create custom countertops and other kitchen areas using our quartz, granite and marble products. Part of the reason some folks don’t consider these areas when they think of stone countertop providers like us is because they aren’t sure whether materials like granite are meant to thrive in outdoor environments. And while a little care is needed in the proper areas, let’s be clear: It absolutely is. Let’s go over how granite survives and even thrives in outdoor circumstances, plus some themes you might consider for implementing granite in your outdoor design. Granite is known as one of the hardest materials on the planet, and its durability is one of its top qualities. At the same time, those who know a bit about it might be concerned about resistance to staining and ensuring its seal always remains strong when put up against wind, rain, snow and other elements. And while it’s indeed true that granite placed outdoors may need to be sealed more often than the same product indoors, the gap here is generally small – and this is the only real difference. Granite is naturally resistant to even extreme temperatures on both ends of the spectrum, plus does just fine with things like direct sun and rain. It’s also naturally resistant to staining; so long as you wipe up any acidic spills quickly and ensure the seal is always updated, you’ll maintain a clean and gorgeous surface even during the wettest seasons. Tucked close: The one weather circumstance we will warn you about with granite outdoors is hail. While it’s very rare, if you live in an area where hail falls regularly, you might consider tucking your granite up against the home. Large, strong hail may chip or crack even strong granite in some cases. If you don’t tuck it away, keep a heavy blanket around to drape over the countertop in case of a hailstorm. 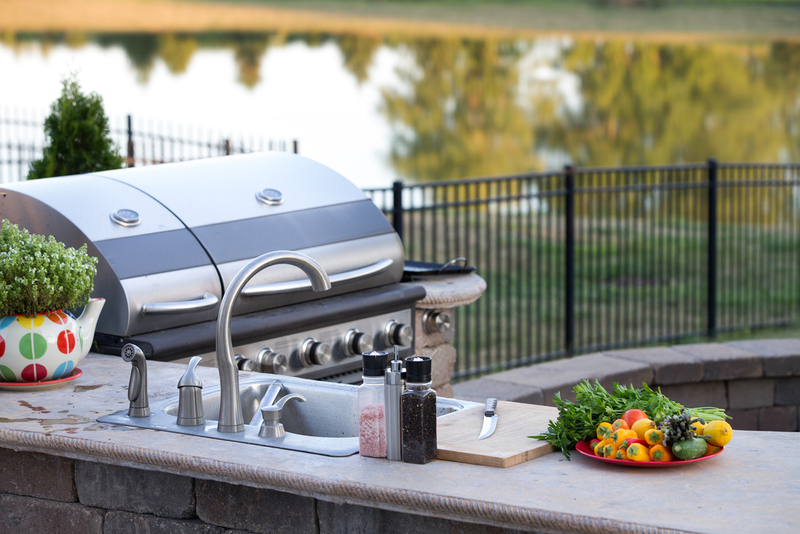 Sweeping countertops: For outdoor areas with plenty of space, sweeping granite countertops allow plenty of space for socializing and food preparation. They also often leave plenty of storage space available. Roofed designs: If you want to be able to utilize your materials even during poor weather, consider roofing to protect yourself and others. Remember that even if you use a roof for your outdoor design, you still have to clean the countertop properly and seal the granite appropriately. For more on utilizing granite kitchen themes outdoors, or to learn about any of our stone counters, speak to the staff at Intermountain Stone & Marble today.